Everybody loves having fresh herbs on hand. Here are four edible plants that are easy to grow in containers so you can have the outdoor freshness of a garden in the comfort of your kitchen. Rosemary is one of the easiest, most low-maintenance herbs you can grow. It does very well in a container, grows quickly, and smells delicious. It doesn't take a lot of work to keep these plants happy. Just give them 6-8 hours of sunlight and don't overwater. They like to be kept warm, so a kitchen is the perfect place for them. Pruning a rosemary plant is simple. Just trim what you're going to use, and your rosemary plant is perfectly pruned. If your thumb is not as green as you'd like, basil is the perfect starter herb for you. To put it simply, it's hard to kill a basil plant. Like rosemary, basil likes warm temperatures and at least 6 hours of sunlight a day. These plants need a regular trimming, and make sure that their soil isn't overly wet. You can hang and dry the basil that you trim in order to use the herbs at a later date. If your basil starts to flower, cut the buds off as early as you can. Once an herb flowers, it begins to lose its distinctive flavors and develops a blander taste. Once you plant lavender and get it started, you’ll have a simple time growing it. Rosemary smells divine and looks beautiful on a kitchen counter. Keep the soil moist, but don't drown it. When you plant your lavender seedlings, place stones or broken pieces of terra cotta in the bottom of the pot to ensure good soil drainage. Make sure there are drainage holes in the bottom of your pot as well. If you can keep the soil moist but well-drained, you can prevent root rot. You can dry lavender the same way you dry basil. Tie your cuttings together with a piece of yarn or string (like a bouquet) and then hang them upside down for about three days. Sweet mint is super easy to grow and keep alive, but it spreads rather quickly so make sure you choose a large container. Like strawberries, mint puts out runner shoots, which grow out of the pot and trail down to the ground in search of soil to start a new plant. 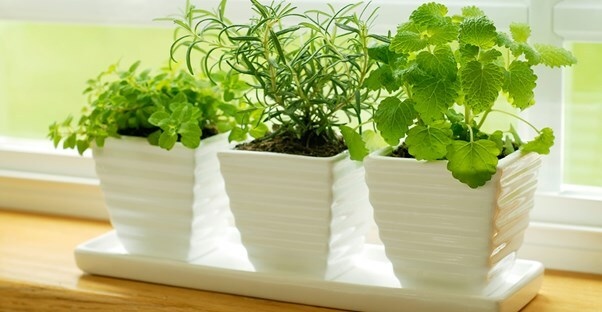 Keep these trimmed and you will be able to keep your mint plant in check. Mint does well if you fertilize it about twice a month and keep the soil around it moist. Like basil, you'll have to trim the buds off your mint in order to keep the flavor full and rich.